You may have noticed our ‘tree house heroes’ campaign running on Facebook in which we identify pros and amateurs who share the same passion for building treehouses and working with nature. This is a continuation of that campaign as we doff our hats to a truly inspirational treehouse hero on the other side of the world: Takashi Kobayashi. Known as ‘Taka’, Takashi Kobayashi lives in Japan and has built a truly remarkable legacy. 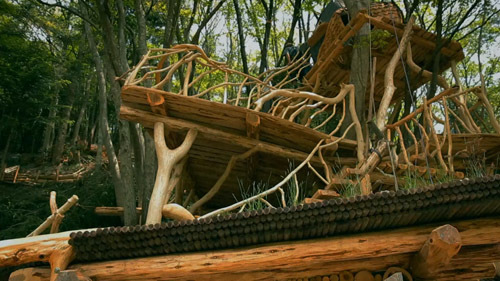 He claims to have constructed 120 treehouses over the last 20 years. In the wake of the Japanese tsunami of 2011 he embarked on his most special project yet. Feeling helpless volunteering in one of the stricken areas 4 days after the tsunami, Taka decided to use his considerable skills as a treehouse designer and builder to benefit the children of Sendai by building them a treehouse classroom. As a self-taught designer, Takashi is a strong believer in reconnecting with nature and his designs speak for themselves. This particular project, known as “The Sendai Treehouse” is situated on a steep slope and utilises an existing mountain cherry tree and Sycamore. Taka’s construction of the treehouse is documented in a short film by retired pro surfer Rob Machado and founder of the Rob Machado Foundation. In the film, Taka talks about the inspiration behind the Sendai Treehouse. Deeply moved by the plight of Japanese children in the aftermath of the Tsunami, Taka wants his remarkable project to give back to the children. He is clearly distraught by the number of young children still unaccounted for and is reminded of his own 3 kids. The emotion is clear to see in the film and has no doubt been funnelled into the creation of this treehouse. The connection to nature has been thoroughly planned, right down to the fireplace which has been created by hollowing out the bedrock. Machado describes Taka’s creation as something that ‘blows you away’, regardless of whether you had seen pictures of his previous work. Even in the video clips, the extraordinary attention to detail is visibly clear. The connection to nature has been thoroughly planned, right down to the fireplace which has been created by hollowing out the bedrock. This treehouse is so striking that it would have been fawned upon by the masses anyway. However, the story behind its creation and the message that it carries elevates both its creator and its aim far beyond beautiful design. 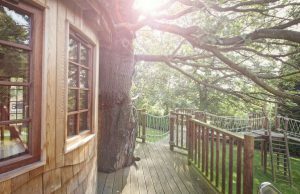 It really strikes a chord with us due to our own project with the Quiet Mark Treehouse and its subsequent donation to the Chestnut Tree House hospice in Sussex. We hope it has a similar effect on you. THROUGH THE LENS with Rob Machado – Taka’s Treehouse from Through The Lens on Vimeo.